Lately I’ve been reading Good Meat, by Deborah Krasner. Part text book, part cook book, Krasner implores readers to give sustainable meat a try and provides the advice, resources, and techniques that will make the culinary adventure worth it. When I say sustainable meat, I am talking about buying lamb, duck, beef, and poultry in their quarter, half, or full state – not just the the pre-cut packages of ribs, legs, and thighs we are accustomed to. She enthusiastically shares the joys of eating shoulders, loins, and even offal as well as the recipes needed to master these more unfamiliar bits and pieces. This is how I found myself with a pound of chicken livers. I’ve seen them sitting on the Whole Foods shelves and I’ve looked longingly at them for months. But I didn’t yet have the guts to cook the guts. As a child, the word pâté made me gag – but so did brussels sprouts – and I could never imagine how smearing blended liver on bread could be decadent. Last year, though, my godmother lovingly made my grandmother’s recipe, sodium free, for me to try at one of my bridal showers. It had a brown-gray color, an unfamiliar stench, and an improbably smooth texture. I timidly dove the knife into the spread and slapped a little on a sodium-free piece of toast. It was delicious. It was delicate. It was rich and creamy. It was love at first bite. So this Thanksgiving, with guests aplenty, and with Krasner’s voice ringing loud in my head, I decided to finally give those chicken livers a try. The recipe was simple and the results were magnificent. The most critical part of the dish is cleaning the chicken livers of the white sinewy parts and any of the darker (almost black-green) pieces on the skin. These can create a bitter taste if left on the livers. While I’m sure you can have the butcher do the dirty work, it is pretty easy to trim them yourself with a small pairing knife. The other piece of advice is that offal smells awful. So be sure to get rid of your trash or compost almost immediately. I used a couple different recipes to create my own, but the main ingredients tend to be butter, shallots, livers, some sort of cooking liquor (sherry or bourbon), and fresh herbs. I also threw in some figs to give it a bit of sweetness. This holiday season, dig deep (literally) into your meat comfort zone and try your hand at pâté or even a more adventurous cut to spice up traditional holiday fare. Honey-glazed sweetbreads perhaps? 1. Melt stick of butter in a large, nonstick skillet over moderately low heat until it begins to brown and gives off a nutty flavor. Add shallots and garlic and cook (constantly stirring) until softened, about 5 minutes. 2. Add herbs, pepper, allspice, and livers and cook (stirring) until livers are cooked outside but still pink when cut open, about 8 minutes. 3. Stir in bourbon or sherry, and remove from heat. Let it sit for 5 minutes. 4. Put mixture in a food processor with the figs and purée until smooth. 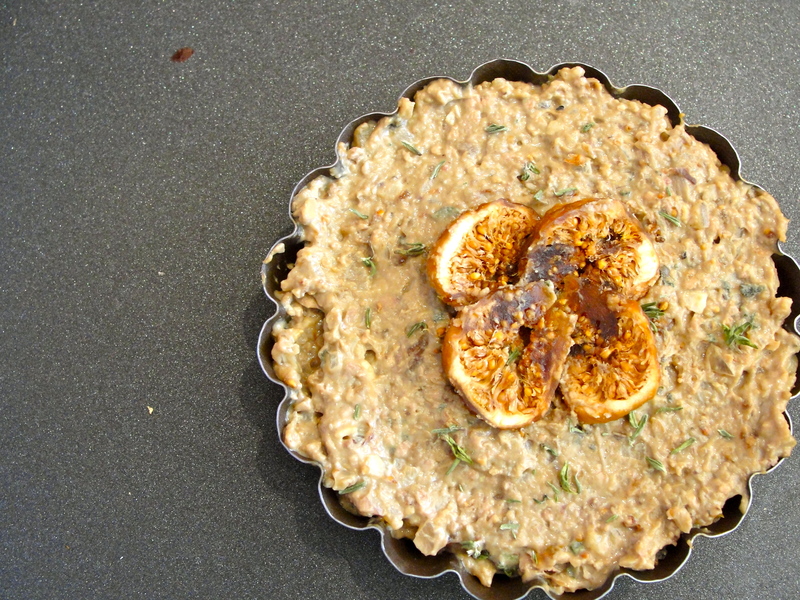 Then transfer pâté to a small ramekin or other container and cover with saran wrap, pressing it flat onto the top of pâté. 5. Chill in fridge for at least two hours. Pâté can be refrigerated for up to two days before serving and tends to taste even better the longer it chills. 6. Garnish with herbs and sliced figs. 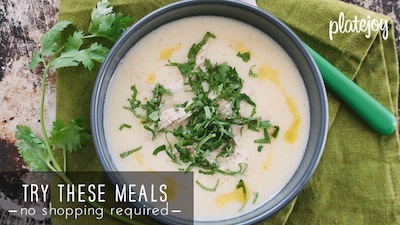 Serve with small toast points made from low sodium bread. 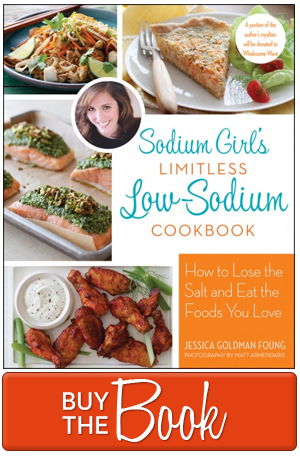 Hi Sodium Girl, my son of 9 months old was born with a kidney condition that requires a very strict low sodium diet. My world has been upside down for the last few months, but when I found your blog, it was a breath of fresh air. It gave me so much hope and inspiration. I look forward to cooking your recipes for my son. Many many thanks!